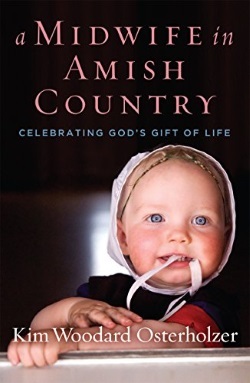 Today we have a winner of A Midwife in Amish Country – in fact, we have two winners, as author Kim Osterholzer has kindly offered a second signed copy for the giveaway contest. Kim also wanted to answer some more of your questions about being a midwife – so we’ve got about 10 more below (see part 1 of her answers here). You’ll find the winners at the bottom of the post. Kathy Baumbusch: I was wondering if the majority of your patients were Schwartzentruber Amish, since the way you described their living conditions sounds so extremely plain. Kim: The first time I was asked that—since the publication of my book—I had to look up Schwartzentruber Amish. My research actually led me to this website! No, I don’t believe any of the Amish communities I’ve served are Schwartzentruber, but the search for the answer to that question revealed to me how subtly unique each little community—or district—can be, as well as how they can change over time as bishops come and go. And I guess I knew that, only I scarcely noticed it. I’ve served primarily among two communities—darting briefly into other communities in order to lend a hand to sister midwives—over the last twenty-five years and I think I can safely say I’ve seen it all. When I first started out, the families we served had very few belongings that utilized any sort of motor. They generally had wringer washers, but no refrigerators. Some had rototillers, but no one had tractors. Even bicycles were rarely seen. There were windmills in the yards and pumps at the sinks, but no indoor toilets or baths or showers. Candles and kerosene lamps were carried from room to room as needed—and only lit if truly needed. Every home looked like a combination antique shop and museum, with nary a frill. Many “homes” were under construction, sometimes for years on end, while families lived in sheds, barns, dilapidated trailers, or unfinished basements. As we moved forward through the years, and as we began working among other communities, things gradually changed. Nowadays, most homes have fully-functioning kitchen and bathroom plumbing. The gas lights are permanent fixtures, snaking into rooms from the walls or ceilings, everyone has a propane refrigerator/freezer, and battery-operated gadgets abound. Many homes—again—these days as opposed to the days of my apprenticeship—are very lovely indeed! There are a few hold-outs, though. One family we’ve served through their seventh, eighth, ninth, tenth, and eleventh births still has no indoor plumbing besides a pump. One family I assisted another midwife with a handful of times lived in an unfinished basement through the births of six babies and, not only did they do without an indoor toilet or bath, they didn’t even have a hand pump! So, no, I don’t think any of the communities I’ve served are officially Schwartzentruber, it just appears some of them have elected to remain extra plain and fairly primitive. Ironically, many of these communities disallow association with those more modern, taking a great deal of pride in their extreme humility. Vickey Cordoba: I read a few short sentences and was very interested to learn that Amish families struggle also. I don’t want to read further because I want to read the book. My question is, is it pretty common for there to be such struggles and how can they afford to pay you with no insurance? Kim: I’ve found, though every family is bound to struggle financially from time to time, Amish or no, the Amish families have fewer issues paying for my services than do English families. As the Amish have never depended on insurance, they don’t seem to give paying out-of-pocket for health-related expenses a second thought. Each family plans to have a large family, and plans to pay for the expansion of that family. And, of course, the cost of birthing at home with a midwife is far more reasonable than the cost of birthing in the hospital. A further advantage the Amish enjoy is their tendency to eschew spending money on frivolity. This plus their admirable frugality renders them more likely than most English families to possess a savings account. Still, I’ve done more than one birth in exchange for vegetables and fruit, or eggs, or chickens and turkeys, or bacon and sausage, or raw milk, or firewood, or tree fellings! Wendy Clark: What preparations would a typical Amish woman make in her home for a home birth? Kim: Preparations for homebirth are universal! In the rear of Nourish + Thrive [ed. note: Kim’s book Nourish + Thrive is described further below] is a list of items families should have on hand at the births, from under pads to extra sheets, from an unopened bottle of almond oil to a stack of baby blankets, from trash bags to a shower curtain, from a handful of wash cloths and a roll of paper towel to rubbing alcohol and hydrogen peroxide, from a belly binder to Epsom salts, from a hot water bottle to a supply of Advil to a couple Ziplocks. If the family plans a water birth, around the 34th week I provide the pool and pumps, plus instructions for ordering a liner and hose, then I go over how important it is to make sure they know how to blow up the pool, that the hose will attach to an indoor faucet, that the hose will reach to where they intend to place the pool, and that the family has a couple good-sized stock pots for warming extra water on the stove in order to help us keep the pool water between 98 and 100 degrees. At our 36th week visit I give each family a little packet of additional items to stash in their box of supplies—peri bottles, a mama diaper, some thick pads, an eldon card and syringe, and a set of baby belly binders—then I look through what they’ve collected to make sure everything’s there and in order and make note of where they’re hiding the box. Lastly, I encourage them to give their house a good cleaning, instruct them to post their address on the inside of their exterior door, and remind them to pen up any dogs averse to visitors when they call for me to come. Susan Heim: Do you deliver twins and multiples as a midwife or do you send them to a hospital for delivery (or surgery)? Kim Osterholzer: Colorado doesn’t allow its midwives to attend twin births at home, but in Michigan, once we established a twin pregnancy was of minimal risk, we most often proceeded to tend them at home. Triplets are a bit of another story. Though I’ve heard of midwives attending triplet births at home, I have not. I haven’t actually had a mother present yet with triplets! My daughter, Hannah, also a midwife, has, however—a delightful Amish family I served three times over prior to my move to Colorado. After Hannah discovered the woman was filling with three babes, Hannah helped the family find a doctor willing to facilitate their vaginal births, Dr. Christopher Stroud at Dupont Hospital in Indiana. Hannah provided care between the family’s visits to Dr. Stroud, employing every last one of our tricks to keep those babies growing within their mama’s womb until it was safe for them to depart at 35 weeks gestation. At 35 weeks Hannah drove the family to the hospital, and all three babies were born with ease soon after checking in. Each baby weighed well over four pounds—I believe one of them was close to five pounds—and no one required a trip to the NICU. Hannah was able to attend the birth! I’ve attended seven sets of twins at home—two sets born to the same mother twenty-two months apart—an Amish woman of twenty, then twenty-two! Two sets of the twins were born to first-time mothers. I did transfer the mother of one set of twins to the hospital for the second twin’s birth by cesarean when the birth of the first twin flipped the second twin transverse. All parties involved enjoyed excellent outcomes! Marie Kennedy: Do some of the fathers avoid the births? Kim: I’ve only twice witnessed dads who appeared to rather be elsewhere during the birth of their babies, I’m happy to say. I’ll post here an answer to a similar question I was asked previously. Not only do the fathers attend the births, they fairly without exception serve as the mother’s primary support! Additionally, most of the fathers in my practice catch their babies themselves! My own husband caught both of our homeborn children! Here are a couple blog posts I wrote on the subject: http://www.kimosterholzer.com/13/homebirthing-daddy-brent-woodard/ and http://www.kimosterholzer.com/19/my-favorite-part/. One of my client’s submitted a story he wrote about catching his second son for publication in a book called The Many Faces of Homebirth, compiled by Shantel Silbernagel. Jim Boles: What type of education process occurs for the Amish couple before birth about the process? What is the back-up plan should the birth process get complicated unexpectedly? Kim: I provide all my clients access to a wealth of knowledge from a wonderful array of books to borrow, to hours upon hours of individualized education and question and answer periods, to a book I wrote called Nourish + Thrive: Happy, Healthy Childbearing I give to each of my clients. Here’s a link to the book: http://www.kimosterholzer.com/nourish-thrive-book/. On occasion I must take a mom and/or a baby to the hospital. I invest all my heart, knowledge, intuition, skill, and sweat in keeping the families I serve at home as long as there truly is hope for a good, safe birth there, and my statistics stand witness that my ability to do so is equal to the general midwifery population. Still, I begin to consider a transport a while before it’s vitally necessary to transport. The idea is for it never to be VITALLY necessary to transport. I work hard to discern through the mists of exhaustion, hope, and dread when the goal of birthing safely at home has slipped beyond likelihood, and to come to grips with that understanding before the only options remaining are to transport the mother and/or baby to the hospital by ambulance and/or to require emergency treatment upon our arrival there. I also work hard to keep the families I serve well-informed and an active part of the decision-making process. As essentially stated above, I prefer to avoid calling 911, and I’ve only had to do so five times in more than 550 births. If my presence isn’t required to keep mom and/or baby stable and/or if the baby’s birth isn’t imminent, we generally drive to the hospital in our own vehicles. If my presence IS required to keep mom and/or baby stable and/or the baby’s birth IS imminent, I ride with the mother and/or baby with my gear at the ready. Those qualifiers also determine which hospital we go to. If we have time, we’ll go where the family prefers. If time is pressing, we’ll go to the nearest hospital. Usually by the time we’re on the way, but sometimes not until we’re actually on the way, I phone ahead to the hospital to let them know to expect us, how to prepare for us, and, if appropriate to the situation, to request a member of the labor and delivery staff meet us at the door. Once we’ve arrived and have been whisked into a room, the first order of business is to assess the state of the mom and/or baby. Then I pass the family’s charts off to the staff as the way forward is determined. At that time, providing the state of the mom and/or baby allows for discussions of such things, the family’s specific concerns and desires will be voiced. When I take a family to the hospital, I’m taking them because there’s something needed I can’t provide. That doesn’t mean the family must automatically sign on for all that hospitals routinely provide the hosts of people they take care of. Happily, the families I transfer are often able to enjoy many of the things they’d looked forward to at home. It’s getting easier to decline procedures such as the administration of antibiotics, the administration of the Hepatitis B vaccine, the vitamin K injection, the administration of erythromycin to the baby’s eyes, and the bathing of the baby, for example. It’s also getting easier to request the opportunity to help catch the baby, to delay cutting the cord, to have immediate and prolonged skin-to-skin contact with the baby, and to keep the baby in the mom’s room through the duration of the hospital stay. Take a minute to think about which things you’d want to either decline or request, and make note of them in the “Hopes, Dreams, & Expectations” handout I gave you. I’ll tuck them away in your chart just in case. I stay at the hospital with the families I take there until the baby’s born, the nursing relationship is well-established, and the mom and dad are ready—physically and psychologically—for me to leave. Should you find yourself in the hospital surrounding the birth of your baby, be aware you may need to restate your desires as shifts of staff come and go. I generally come visit the new family between twenty-four and thirty-six hours postpartum, wherever they are, and once they’re back snug in their home, resume regular midwifery care. Post-transfer postpartum care is usually a little more involved as we all need to process what happened. And rest assured, I’m game for all the processing transported families require! Alice Gober: When and how were you called to become a midwife? Kim: I tell that story in detail in my book, but I’ll happily share a snippet of it here. An essential preface to the story is my first real exposure to birth at age twelve and the fainting spell that followed close on its heels. I share that excerpt of the book on my blog: https://www.kimosterholzer.com/03/first-catch/. In spite of that first disconcerting encounter with birth, I felt myself called to homebirth midwifery by God Himself at the age of fifteen. A CHILLY WIND WHIPPED SNOWFLAKES INTO OUR eyes and teeth as my sisters and I laughed and ran around the parking lot with our friends, as eager to start our day as young fillies are to prance out into the sunshine come bright mornings. A group of parents stood huddled around a man with a clipboard, clutching their jackets to their chins until the man, Mr. Siedlecki, one of our pastors and leaders of our homeschool endeavors, let out a piercing whistle. Swarmed now by the children as well as the parents, he called names and pointed fingers until each of us was accounted for and stuffed into a vehicle. The next thing we knew, we were on the road, a long string of station wagons and minivans making their way north for a day of skiing. Continue reading excerpt from A Midwife in Amish Country, Chapter 5. Roberta McMahan: Do you lose many babies? If so how do they deal with it? Kim: Oh, thank goodness, no! Thank goodness, no. Except, of course for miscarriages—lots of miscarriages—which actually are every bit as sorrowful as any other loss. The hardest birth I was called upon to attend was that of a young Amish couple and their first baby. A catastrophic event too emergent to accomplish a successful transport to the hospital occurred. The event severely compromised the baby and, though I worked with all my heart and soul and mind and strength to coax the wee little girl to life, I lost her. The second hardest birth I attended was similar, except the tiny baby boy died within his mama six days prior to her labor. I served both women through their subsequent pregnancies and births, and those births were indescribably healing for us all, but I know I’ll carry those lost babies and heartsick parents in my depths till I breathe my own last breath. Here’s a blog post I wrote a about the first birth: http://www.kimosterholzer.com/29/loss-life-anew/. Fortunately, birth at home with a midwife is every bit as safe as birth in US hospitals, with a vastly superior intervention and morbidity rates. See the following blog post for more information: http://www.kimosterholzer.com/09/birth-is-as-safe-as-life-gets/. Diane Paulson: What is your biggest blessing of having worked with the Amish for so long, so hard? Kim: Oh! Easy! To work within the same community for so many years means I’ve been blessed to serve the same groups of families over and again, and throughout generations. I treasure the relationships we’ve forged—relationships that have remained intact and active despite moving 1200 miles away—and the chance to watch the children I’ve welcomed earthside grow up. The experience that crowns what I’m talking about here is the morning I caught a baby for a woman I caught at birth eighteen years before. The twin to that crowning experience is the fact my own homeborn daughter now serves the same community as midwife. Congrats Rose and Vivian. Send an address to me at ewesner(at)gmail(d0t)com and I’ll pass that to Kim so she can get your books to you. If you didn’t win, you can pick up a copy of A Midwife in Amish Country here. I’m off to order the book since I didn’t win.. . It sounds so very interesting. Congrats to the winners and thanks Eric and Kim for the opportunity to enter the giveaway. Thanks Kim H. Kim O really went the extra mile to share with us here, and all I’ve read in the book so far has been great, so I hope you enjoy it. How do readers choose Amish novels?